Kurlon and Sleepwell produce a variety of mattresses in India. Both companies offer rubberised coir, spring, and foam mattresses. Sleepwell also manufactures mattress accessories, such as pillows, comforters, and mattress protectors. 19,615-21795 Generally more expensive than Kurlon and Sunday Rest. Different warranties on different models. Often 1-3 years.Pricier models have 5 to 15 to Lifetime Warranty. Different warranties on different models. Cheaper models have warranties that last 1-3 years. Pricier models have 7- to 10-year warranties. Most Kurlon mattresses are 4 to 5 inches (10 cm to 13 cm) thick. Sleepwell mattresses are often at least 4.5 inches thick, with some models as much as 8 inches (20 cm) thick. Generally depends on the WareHouse . In the best possibilities , it would reach you in 2-3 days. Generally depends on the authorised dealer. In the best case scenario, it would reach you in 2 days. Best in Explanation of the Mattresses and their types - In Pune .They didn't show much interest. Have visited a few authorised dealers in Sarjapur, Bangalore. They don't really care about customers. Since these are well established brands dealers are generally not customer friendly. No trial policy No trial policy. Best View , Fully Product Details and Descriptions Looks too amateur. For a company as large as Sleepwell, they could've done better. Kurlon's range of spring mattresses includes Angelica, Panacea, and many others. Sleepwell has a smaller range of spring mattresses, including Amity, Harmony Royale, and Tranquil, as well as a few others. Both companies manufacture rubberised coir mattresses as well. Kurlon's selection includes Budget, Klassic, Kushi, and several others; a full list of their rubberised coir mattresses can be found here. Sleepwell offers rubberised coir mattresses like the Alpha DLX and Zenith Luxury. Their full list of rubberised coir mattresses can be found here. By far, Kurlon and Sleepwell manufacture foam and memory foam mattresses. Kurlon has foam models like the Magna and even has a therapeutic foam mattress called Ortho. Sleepwell's foam mattresses include the Nano, Regal, with their full foam line available here and here. Kurlon and Sleepwell use similar materials — rubberised coir, foam and memory foam, and springs — to manufacture their mattresses. Those who suffer from allergies should be cautious when it comes to rubberized coir. Coir is a common allergen, as is the latex used specifically to create the rubberized coir found in mattresses. Either look for a coir or latex mattress that has a good padded covering or skip them altogether. Both Kurlon and Sleepwell offer standard Indian mattress sizes. Furthermore, Kurlon will create custom mattress sizes on request. In general, Sleepwell mattresses are thicker than Kurlon mattresses. Most Kurlon mattresses are 4 to 5 inches (10 cm to 13 cm) thick, while Sleepwell mattresses are often at least 4.5 inches thick, with some models (e.g., Majesty) as much as 8 inches (20 cm) thick. In most all cases, Sleepwell mattresses are more expensive than Kurlon mattresses. 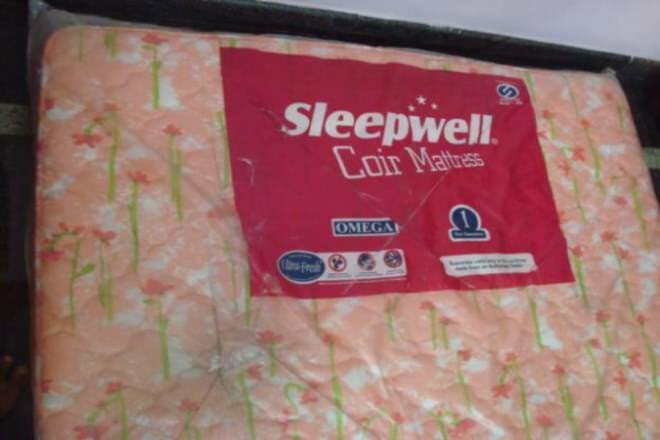 Sleepwell products can be bought either online through the company's website or at one of the many locations which sell their products. Those wanting a Kurlon mattress must buy one in person from one of the businesses which sell them. In general, Sleepwell mattresses are more widely available across India. Kurlon often has different warranties on different mattress models. Cheaper models may have only a one- or two-year warranty. Their therapeutic foam mattress has a 3-year warranty. Rubberised coir mattresses have 5-year warranties. Similar to Kurlon, Sleepwell's warranties vary by product. Their cheaper mattresses (e.g., Victor) often have short warranty periods of 1 to 3 years, but more expensive Sleepwell mattresses often come with 7- to 10-year warranties. Some distributors may offer additional, longer warranties or repair deals separate from those offered by Sleepwell and Kurlon. kURLON is the best My family is using it & are very satisfied. ON KURLON, YOU SLEEP WELL. Sleepwell mattress have a definite edge, we bought three mattress for our new house six months back and belive me we are more than satisfied. great mattresses. Sleep well gives better sleep quality, we have used kurlon also but sleep well has better matress and my family really enjoys sleeping on Sleepwell.